I perched on her bed as she leaned back into the froth of pillows, blankets tugged up to her waist. She was always my one for cozy places. But I wished I could cuddle my daughter’s heart up like that, as easy as snuggling deeper. Only three days into her very first year going to public school, and already grappling with that beast we mommas fear for our daughters: Girl Drama. As befuddling as this situation felt to my daughter and me, there’s always One who sees the situation with glass-like clarity, the Holy Spirit. He knows each of the girls’ hearts. He sees the clear path through this maze, even when we’re lost within it. That night, our discussion was rich to me, because I could see my daughter learning to navigate her situation from the mind of God. Here, I’ve compiled some discussion starters for helping our kids transition from their flesh to listening to the Spirit. You’ll be able to choose which is best for each situation. 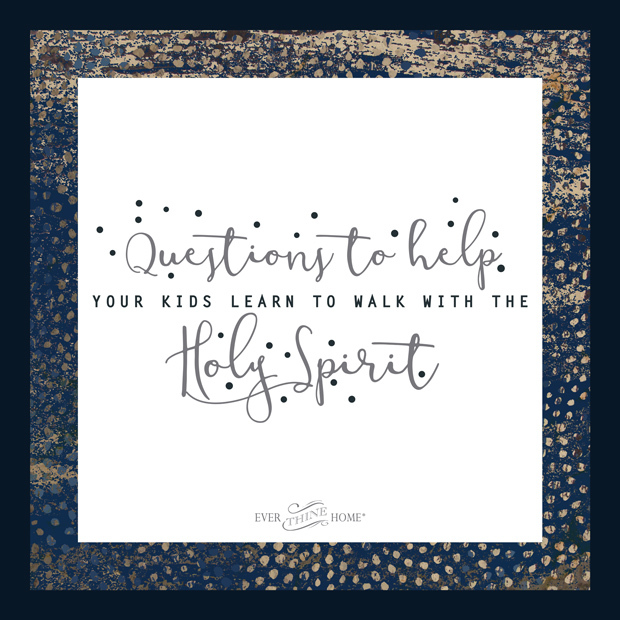 In addition, see here my practical ideas on ways to help kids walk with the Spirit, and Barbara’s tips on teaching your child to hear God’s voice–as well as these additional questions to identify God’s voice. Buuuuut–I’m not thinking in the next situation with your child that you’ll be whipping out all of the discussion prompts below. And even better: I’d love for you and your child to be able to remember these, even when you’re out and about. So let’s go with five key ideas–one for each finger. The Five-finger Method: How Can I Think About What the Spirit Wants? GOD: What does He have to say about this? HEART: What do you want to do? What’s right and wrong about that? What’s the “log” in your own eye? LOVE: What would it look like to be loving? WISDOM: What does wisdom say we should do? TRUST: What would it look like to bravely trust God in this? Important: These questions are designed as “starters”–heart-probing questions to help your child examine his or her own heart, as well as considering the mind of God in every situation. What do you think God thinks about this? What’s the “log” in your own eye? What does it look like to love this person well? What do you think wisdom looks like in this situation? Is there anything you’re afraid of in this situation? Are you seeking to escape anything? How could we trust God in this–and what would it look like to be “strong and courageous”? What would you like me to pray for? Can we pray together? What do you feel like you “should” do? Is that a good pressure from God, a free choice to obey Him–or are you doing this out of shame or fear of some kind? Are there other ways to see this situation rather than the way you’re looking at it? What are the kindest possible ways to interpret the other person’s actions (making “charitable judgments”)? Are you returning a blessing for an insult? God talks a lot about the “seeds” we plant with the things we do (read Galatians 6:7-9 together). What am I sowing in each of these choices? What would I be preparing to reap? Obviously, learning to walk with the Holy Spirit is anything but formulaic. But I do believe there are ways we can train our hearts–and our kids’!–to listen, asking the right questions to discern the mind of God in every situation. That night, as I spoke with my daughter, perhaps my greatest pleasure was watching her heart move before my eyes into even more into alignment with His. As a bonus, I could see that He’d already been speaking to her, and her heart had already been ready to listen. No, it’s not always like that. But the constant practice is priceless. So thankful to hear this! Grateful for the encouragement, Simone.